Many composers, especially at Remote Control but also elsewhere, have been using a Pro Tools rig as their console and recording setup. This especially useful when working in 5.1 surround, because channel counts start to add up. When I recently upgraded my Vienna Ensemble Pro sample computer, I used my old computer as a Pro Tools rig. The main computer is a Mac Pro (upgraded to a 5,1) running Cubase 9. The Vienna Ensemble Pro computer has an Intel i7 6950X 10-core processor and 128GB of RAM. This does nothing but run VEP instances of Kontakt samples. 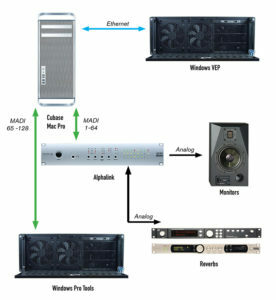 The third computer is another Windows machine running Pro Tools HD. They have only recently made Pro Tools HD available for purchase again, the main reason you might need that is for channel count or to work in surround. Vienna Ensemble runs as a plug-in on Cubase, and audio plays from the VEP computer over an ethernet connection. I have 34 stereo pairs of instruments coming from VEP to Cubase. These are mostly stereo instrument families (horns, violins, etc) but include a rear set for Spitfire percussion samples (these play in 4.0 quad.) I do most of my mixing in Cubase groups, as this is saved with the project. I have two hardware reverbs coming into Cubase, a Lexicon PCM96S and Bricasti M7. All of the hardware synths also get recorded into Cubase, via the SSL Alphalink converter. I have an RME MADI FX PCI card in the Mac, which has three MADI I/O for 194 ins and outs. One of those goes to the SSL Alphalink, the other goes to a MADI card installed in the Pro Tools computer. 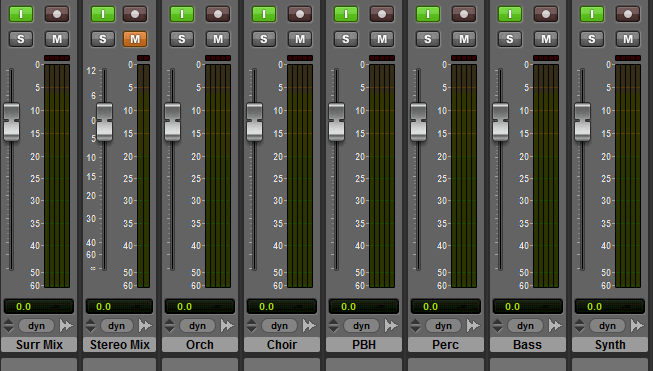 I have stereo pairs for horns, brass/winds, piano/bell/harp, bass, solo/FX, choir, and strings. I have percussion mid and low stereo stems, and they share a surround stem. Synths are also in quad. Finally, I have returns for the Lexicon and Bricasti reverbs, as well as one for an DBX 120X-DS. All of these are bussed from Cubase subgroups to Pro Tools via MADI. Final mixes and stems are recorded in Pro Tools for delivery to a dub stage. The third column shows the I/O channel numbers as they appear in Pro Tools, the fourth column shows the I/O channel numbers in Cubase. OK, now how do we hear this? Well the RME card on the Mac includes software called Totalmix. This software allows you to route and mix MADI signals. So I took channels 65-70 and routed them to outputs 1-6. Now we have analog output from Pro Tools, and we don’t need to switch sources on the Alphalink if we want to hear audio from the Mac. They’re both live all the time. I was originally planning to route to and from the Pro Tools machine using ADAT I/O for the Alphalink, so I’m pleased that this routing system worked. So was it worth it? Absolutely. I formerly had all of this bussing and submixing happening inside Cubase, so there were a dozen or so surround busses and tracks in my autoload project Projects took several minutes to open and CPU was pretty high before hitting play. With this system, projects open in 20 seconds and CPU is sitting around 10%. So just for that gained overhead the upgrade was worth it. I have a single timeline in Pro Tools for a project, with every cue and the video. I have individual Cubase projects for each cue, so the Pro Tools project allows me to play through an entire film and hear how the music works from scene to scene. Even if you need a Mac-formatted drive for Pro Tools delivery, there’s software like TransMac to allow you to copy to HFS drives on Windows. I hope this made sense to at least one person. Have questions? Let me know in a comment below. You didn’t explain how you go from stereo to 5.1 deliveries in PT. Are you using NuGen Upmix to generate 5.1 from your stereo tracks? Also brass and wind combined? That’s a problem. For me, I would need separation for mix engineers. Interesting setup though. I’m using the Lexicon PCM96 Surround to get surround from the orchestral tracks. I’ve played with Nugen Halo a bit, I might pick it up soon. I had to combine those wind/brass tracks to get to the max 32 channels that Pro Tools allows. If there is a solo then that goes on the solo/fx track. And I can always do a second pass or adjust the template for the particular project if I need to. How do you have the video running, in PT synced to Cubase? Still in development, but I plan to run video in Pro Tools. Hopefully to its own monitor. Does the Bricasti Stereo RT, go to a specific stem, and the Lexicon to a final 5.1 mix? Or do you do multiple passes to make possible the Bricasti RT to more than a stem? Bricasti goes to the piano/bell/harp stem, Lexicon to the orchestra stem. Did you experience any timecode issue between Pro Tools and Cubase? Setting up MIDI timecode over LAN presented a few issue for me, with both machines being off by a few frames. How did you overcome this problem? It’s been a bit flakey running Pro Tools over MTC. Avid really wants you to buy their hardware (Sync IO.) But I can usually make it work.